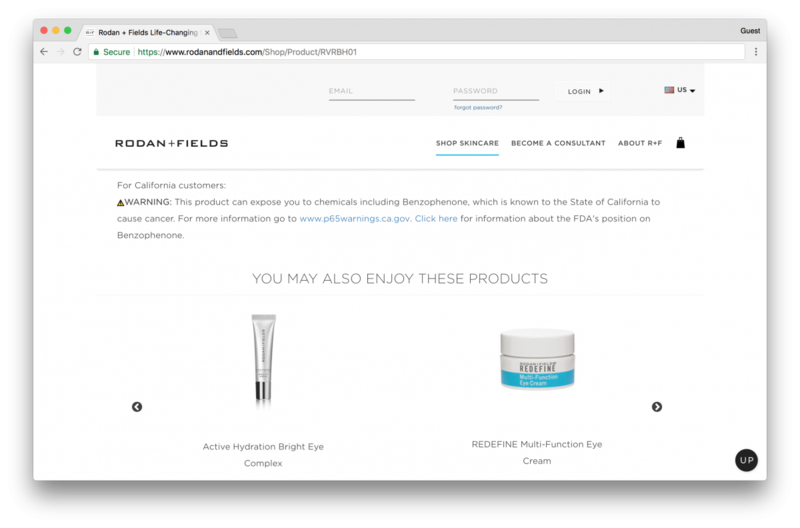 WASHINGTON - EWG urged the U.S. Food and Drug Administration and California's attorney general today to stop Rodan + Fields from making misleading claims about benzophenone, a chemical that has been linked to cancer. Rodan + Fields tells consumers to click on a link which, the company claims, provides the FDA’s views on benzophenone. However, the link actually leads consumers to a website operated by the Personal Care Products Council, an industry trade group. The link is adjacent to a cancer warning required under the California law known as Proposition 65. Today, Rep. Frank Pallone offered an amendment that would give the FDA new power to review potentially dangerous chemicals used in personal care products and subject the cosmetics industry to greater oversight. Sens. Dianne Feinstein and Susan Collins introduced legislation in May that would also strengthen the FDA ‘s authority over the personal care products industry. To view EWG’s letters to the FDA and California attorney general, click here and here.